The Meaning and Origin of the word 'Keep', 'Donjon' and Dungeon! The meaning and origin of the castle keep explain this unusual word! The word 'donjon' was originally used to describe the castle keep (the tower which was built on top of the motte). The origins of the word 'Donjon' was derived from a Latin word meaning 'Dominating Point'. Later the word 'Donjon' was changed to 'Keep'. The word 'Keep' means "that which keeps or protects - the strongest and securest part of a castle, often used as a place of residence by the lord of the castle". The word 'Keep' also means "To hold, not to let go of, to retain in one's power or possession". The term 'castle keep' is therefore explained! The term 'Donjon' was not lost - it was a derivative for the word 'Dungeon' - the Nobles moved from the towers to more easily accessible living quarters and important prisoners were held in the 'donjons'. As time passed these towers for prisoners ceased to be built and prisons were built below ground level - the dungeon! The Castle Keep was the tower which was built as the most protected part of the castle. The square shaped stone castle keep is the dominant feature of many of the castles in England which were built by the Normans, and one of the most commonly recognised parts of a Castle. The purpose of Norman Stone Castles ? What did Norman Norman Stone Castles look like - the Architecture? Converting a Wooden Castle Keep to a Stone Castle Keep! Many of the initial wooden constructions of the Motte and Bailey Castles were strongly fortified by converting them to stone castles. The wooden castle keep featured in the early Motte and Bailey castles was re-built as a stone keep. The first development and fortification of the castle keep was to raise the timber buildings on stone walls and once this was complete to entirely re-build the Castle Keep (tower) in stone. Thus emerged the first Stone Castle keeps of the Medieval Era - including, of course, the famous Tower of London. The top floor of the castle keep often contained the kitchens and ovens. Should the castle keep come under attack boiling water, burning oil, or hot sand could be prepared! The Square Keep changes to a Round Keep! The first type of castle keep was square. 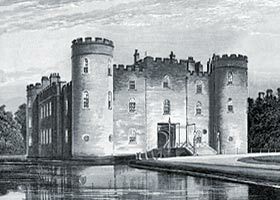 The square Castle Keep proved to problematical as it was subject to assault by mining. Tunnels were mined leading to a weak part of the stone castle (the corners of the square stone keep). The corners were also subject to blind spots - an attacker could take cover behind the corners. These defensive problems led to a change of architecture towards the end of the 12th century and the development of round stone castles and keeps began. The round castle keep afforded no screen to the enemy. The shell castle keep was developed because the motte (mound) on which the castle was to be built could not bear the weight of a solid stone tower. This process was called 'Revetting the Motte'. The principle of 'Revetting the Motte' was to prevent the Motte collapsing under the heavy weight of a stone keep. The shell castle keep was created by building a stone wall which completely surrounded the upper part of the motte (mound), similar to the old palisades. These types of keeps were hollow and distributed the weight. The shell castle keep walls were strengthened by the addition of wall towers and buttresses. The walls of the Shell Castle Keep were between 8 and 10 feet thick and could range from 20 to 25 feet in height! This type of shell was not fragile! The shell keep walls were often strengthened even further by the addition of gatehouses, wall towers and buttresses. The wall acted as a defence during the re-building process. The Lord of the shell keep castle, and his family, were usually housed within the circular area enclosing the keep. The development of the Castle Keep was important as the most protected part of the castle. The square shaped stone castle keep is the dominant feature of many of the castles in England which were built by the Normans, and one of the most commonly recognised parts of a Castle - the information provided on this page charts the objective and development of the English castle keep.